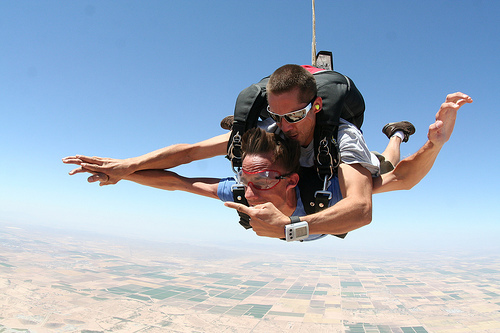 There is nothing better than the pure adrenalin rush of skydiving in Arizona. Whether it is your very first tandem jump or your thousandth solo jump, the great drop zones and the magnificent views in the Grand Canyon State make you believe in a Higher Power as you float serenely down to earth. Arizona is also often referred to as the Sweetheart state or the valentine state, probably because it gained independence on Valentine’s Day in 1912, but I prefer to think it is because the beautiful vistas fill one with love for Mother Earth. Skydive Arizona is located in Eloy, Arizona, the heart of the Sonoran Desert, which lies halfway between Phoenix and Tucson. Skydive Arizona was started in Coolidge, Arizona by Larry and Liliane Hill in 1986, and moved to its current location in April of 1991 due to the need for further expansion. Since then it has become the premier drop zone for skydivers of all levels, and averages in excess of 135,000 jumps per year. This astounding fleet is capable of putting more than a whopping 240 skydivers in the air at one time, which equals in excess of 500 jumps per hour! Grocery shopping will be a little difficult as the grocery store is not in walking distance, but the bunk house has a microwave as well as refrigeration. Bedding is no problem as this is available to you on arrival, but visitors are free to bring their own sleeping bag if they choose to. For those who are making use of the bunk house, storage lockers are also available. You might want to do some laundry while you are there which is easy accessible as it is close to the bunk house. Showers, of course, is also available. There are Team Rooms available that can accommodate 4, 6 and 10 people, and they include a small refrigerator. These rooms are available for video debriefing. There are showers and a laundry located in the vicinity of the bunkhouse and Team Rooms. There are two types of RV parking. Long term parking near the drop zone with 14 electric hookups as well as 24 full hookups. Short term parking on the drop zone with 9 electric hookups and 10 full hookups. Make sure you reserve your parking as these are popular parking spots and are normally fully booked in peak season. There are a number of off-site hotels situated from 0 – 20 miles from the drop zone. The “World Famous” Bent Prop Saloon & Cookery is a full-service restaurant and bar situated on the drop zone. They offer three meals a day and their hours of operation depend on the season. There are also a number of other restaurants within a 5-15 minute drive from the drop zone. You can buy any type and brand of new skydiving equipment such as jumpsuits, helmets, altimeters, and other skydiving clothing and paraphernalia from Square2 Parachute Sales. They also have a large rental and demo equipment program. Desert Skies Parachute Rigging is a full service parachute rigging, inspection, maintenance and repair facility located right on the drop zone. 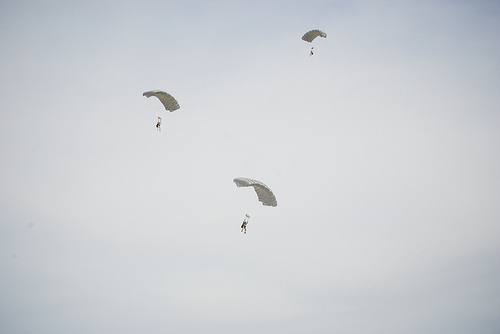 It is staffed by two experienced FAA rated Master Parachute riggers. Acupuncture – Craig Amrine, a licensed acupuncturist who treats a variety of conditions and illnesses including shoulder/back/neck problems, emotional disorders, digestive problems, and asthma/allergy/sinus problems offers acupuncture at the Skydive Arizona drop zone. Creepers & Creeping Areas – Skydive Arizona provides more than 40 high-quality, heavy-duty creepers in several creeping areas. Fitness Center – The fitness center is outfitted with Nautilus, a complete set of free weights, bench presses; incline benches, and much more. There are also separate men’s and women’s showers. Indoor Packing – There is 51,000 square feet of climate controlled indoor packing. Packers – There are 6 packing concessions, run by FAA certified riggers. Swimming Pool – There is a heated pool situated in the center of the lawn courtyards for you to relax in after a great day of skydiving. Toltec Healing Arts Center – Katharine M. Powell LMT is trained in Deep Tissue, Myofascial Release, Swedish massage and Reiki. She is Nationally Certified, Licensed in Arizona and a Member of AMTA. 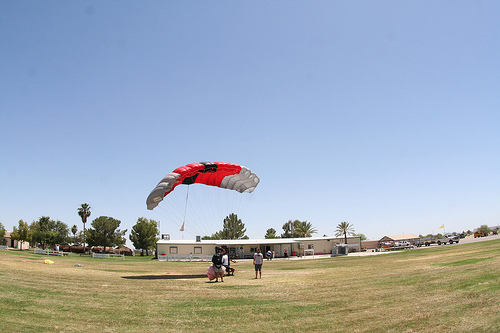 Wireless Internet Connection – Free wireless internet connection is available on the Skydive Arizona grounds. Skydive Arizona offers state of the art equipment, the best skydiving aircraft, an excellent staff, fantastic facilities, and great weather, which all combine to make your experience the best experience of your life. They offer instruction and tandem jumps for the newbies as well as an Accelerated Skydiving Program, which includes thorough ground instruction at every level and thorough debriefing after each jump. 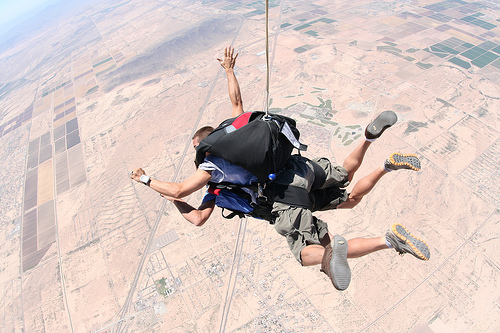 Skydiving in Arizona, the skydive capital of the world, is sublime. The views are magnificent, the weather is fantastic, the people are friendly, and there is absolutely no better place in the world to skydive. Whether you are looking for the thrill of trying skydiving for the first time by doing a tandem jump or you are a seasoned professional skydiver with thousands of jumps under your belt, you have not skydived until you have jumped in Arizona! This entry was posted in Air Sports, Arizona, Sky Diving, Travel, United States and tagged Arizona, arizona sport, Skydiving, skydiving in arizona, sports. Bookmark the permalink.